Apple Inc.’s iPhone 5 supply shortfall is being exacerbated by a quality-control crackdown at Foxconn Technology Group that’s designed to cut the number of devices shipped with nicks and scratches, according to a person familiar with the matter. Stricter benchmarks have hampered production of the iPhone 5’s anodized aluminum housings, forcing Foxconn’s Hon Hai Precision Industry Co. to idle factories, the person said. The slowdown is heightening supply concerns that have cost Apple about $60 billion in market value since the iPhone debut — a shortcoming of the drive to imbue products with qualities that make them alluring yet more difficult to manufacture. The aluminum being used is the same as Apple uses for its MacBook line up, known as “anodized 6000 series aluminum.” As quality controls ramped up by Foxconn for better yield rates, fewer housings met standards, lowering supply and causing shortages of parts at Hon Hai (Foxconn) warehouses, which eventually led to stoppage of iPhone 5 production for a day, according to sources. Bloomberg interviewed assembly line workers of the aluminum housings and they noted pressure has intensified due to stricter standards, but they reiterated the new aluminum backing was more delicate and prone to scratches throughout the assembly process. Our own iPhone 5 came with a scratch on the back right out of the box, which was a common theme for numerous iPhone owners as well. Apple has since replaced our cosmetically defective unit with a new one. 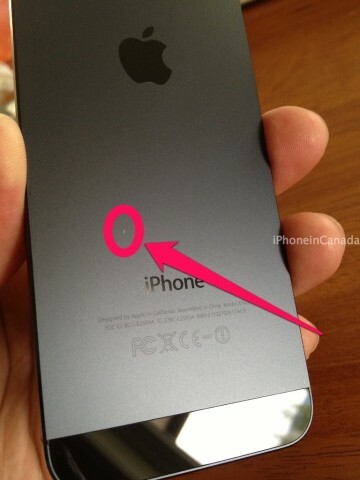 Apple executive Phil Schiller noted in an apparent email scratches are expected on aluminum products. How was the condition of your new iPhone 5 out of the box? Did you see any scratches or nicks?